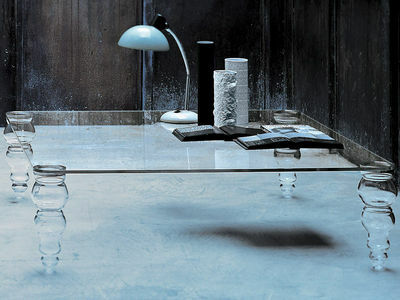 Totally transparent, this table combines purety and simplicity with sophisticated and baroque legs. A superb blend of styles ! Forms from the past are interpreted with the modernity of the glass. Sublime ! ''Post modern'' exists in high and low table and with diffrent forms of top (rectangular, square and round).